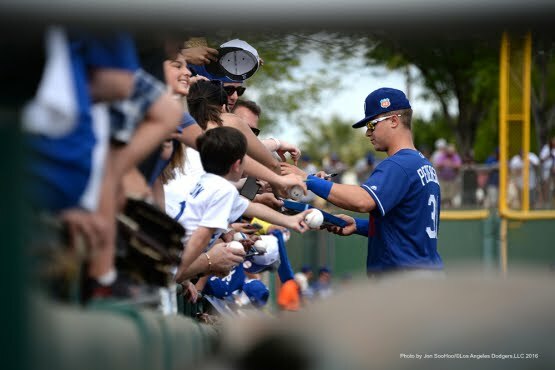 Joc Pederson continues to delight the fans as he signs autographs for eager fans along the 3rd base line in yesterdays game. Pic via Jon SooHoo/LA Dodgers 2016. Go here to check out more pics taken by Jon from the day. Via Ken Gurnick at MLB.com, "Crawford told he'll back up Ethier in left field." "They told me there will be a lot of at-bats for me, but 'Dre starts, and he's earned it," said Crawford, who went 2-for-3 with a triple and two RBIs in Sunday's 5-2 win over the Giants. Not really unexpected. Via ESPN, "MLB saves Chase Utley from slide suspension." He will not have to serve that two-game suspension levied last year. Via Doug Padilla at ESPN, "Hyun-Jin Ryu's downtime still not considered a setback." Time to jump on the Lee Train? Via Doug Padilla at ESPN, "Dodgers' Zach Lee makes solid opening argument." RHP Frankie Montas, who had rib surgery before camp opened, has resumed throwing. Who the Heck is Bruce Brubaker?